Was anyone else disappointed by the lackluster weather on the summer solstice? I can usually depend on June 21st (my half‐birthday) for some decent weather. But sadly, this year I can count the number of warm, sunny days on one hand. Our CSA box did brighten my week though, full of tender greens, succulent strawberries and even a jug of maple syrup. The maple syrup was especially welcome. It’s hard to believe the amount of maple syrup our family goes through. We love it in yogurt, on oatmeal, and, of course, on waffles and other breakfast treats. I also bake with it whenever possible, preferring it to more processed sweeteners. Though not every dessert recipe is suitable for maple syrup, this pound cake recipe is an ideal platform. I loved the subtle maple flavor in the batter. I can’t even begin to describe how good it smelled while baking, like pancakes and vanilla and freshly baked bread all at once. Using yogurt and oil instead of pound cake’s traditional butter base results in a lighter cake that stays lusciously moist for days — and won’t destroy your summer “I have to wear a bathing suit in public” diet. 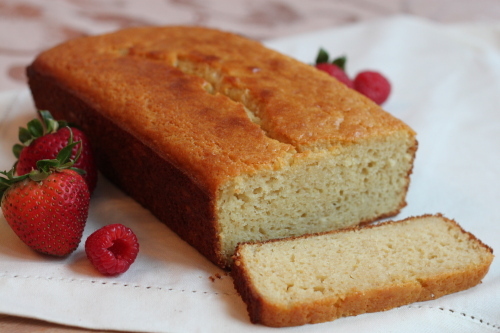 The pound cake is perfect for pairing with the season’s berries, sliced or slightly macerated. I also like this pound cake for breakfast, lightly toasted and spread with my friend Alex’s amazing homemade raspberry jam. Jam recipe forthcoming if I can ever talk her into sharing it. For a healthier and more substantial loaf (pictured above), substitute 1/2 cup of whole wheat flour for 1/2 cup of the all‐purpose flour. I prefer white whole‐wheat flour or whole‐wheat pastry flour for a lighter texture. Position the rack in the center of the oven and preheat to 350°F (180°C). Generously butter a 8 1/2 × 4 1/2 × 2 1/2‐inch metal loaf pan. Combine the yogurt, syrup, sugar, eggs, vanilla and lemon zest. Stir or whisk to combine. In a separate bowl, combine the flour, baking powder and salt. Add the dry ingredients to the wet ingredients and stir to incorporate. Add the oil and fold in gradually until the oil absorbs completely into the batter. Pour the batter into the prepared loaf pan. Place the pan on a baking sheet in the oven and bake for about 50 minutes, until a tester inserted into the center comes out clean. Cool the cake in its pan on a rack for 5 minutes. Cut around the pan sides to loosen the cake, then turn out onto the rack. Turn the cake upright on the rack and cool completely.